In addition to the base wager, players can make three Hi/Lo side bets that pay out 1:1 and 1:10. A side bet wins if the player’s two initial cards are lower, equal to or higher than 13. This is a two-deck game that basically utilizes standard European blackjack rules. Splitting is allowed once per hand, and rules allow hitting hands after splitting Aces. A player can double down if holding 9, 10 or 11 in total. The 2:1 insurance is offered when the dealer holds an Ace. 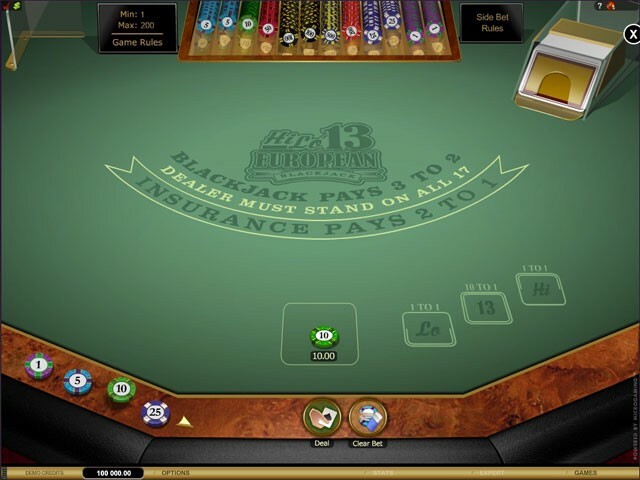 The Hi Lo 13 Blackjack is delivered to online casinos by Microgaming.